Description: This is a fun collaboration of piecing clothing and jewelry together to create a more stylish rendition of the original outfits worn by Disney characters. For The Great Mouse Detective, they too have been treated to a new modern (and feminine) look. This one is for Dr. Dawson. Don't ask me why he was titled, "Mr." He did not go through years of medical school just to be called mister, thank you very much. For set prices on the clothing/jewelry, check out Polyvore. Set created by Lala Kay. 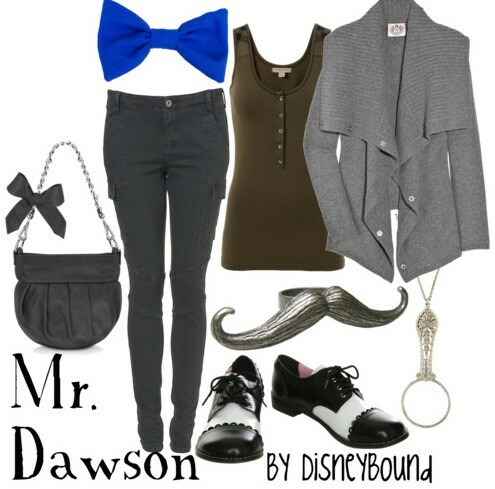 Photo credit goes to the tumblr page, Disney Bound on June 15, 2011.